Comment: In the first chapter of A Single Shard, Tree-Ear watches the potter Min shape, destroy, and reshape clay on his wheel. “Each of the four efforts had looked identical to Tree-ear, but something about the fourth pleased Min.” Min is unlike most of the potters in his village, meticulous, precise, and an artisan who values quality over quantity. The description of Min’s work and process is one that gives readers a fuller view of the Potter’s work in Jeremiah. The relationship between Tree-ear and Min is similar to the relationship between Min and his clay. At first it seems that Min only desires to tear Tree-ear down; over time, readers see how Min is shaping Tree-ear into his apprentice, a skilled artisan, and eventually, a son. In the letter to Philemon, the story of Onesimus is one of changed perceptions. Before, Onesimus was a slave, now he is considered a brother in Christ. Similarly in Samir and Yonatan, we read of changing perceptions. When he enters the Jewish hospital, Samir is afraid and untrusting of the Jewish children he shares a room with as well as the nurses who care for him. Over time, his perception changes. The most poignant display of this change in affection might not be suitable for a worship service, as it would inspire bathroom humor in a crowd of children. There are, however other examples of Samir’s changing perception—such as his time spent playing video games with Yonatan. As Yonatan discusses their blue and green avatars, Samir realizes that they are, in essence, the same. By the time Samir is discharged, he considers the people he once feared to be family. “So therefore, none of you can become my disciple if you do not give up all your possessions.” This text is difficult to swallow. Many of us have an addiction to stuff. Having stuff helps us to feel secure, potentially increases our social status, and makes us feel successful. Jesus’ message of discipleship suggests that security, status, and success should be measured on a different scale. The cost of discipleship is high, but the rewards are great. Discipleship invites us to a transformed way of living and a deeper relationship with God and God’s creation. 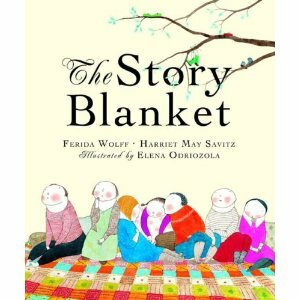 The Story Blanket is a beautifully illustrated story depicting a life of discipleship. Children are given an example of what it might look like to give up one’s possessions and follow Jesus. Babba Zarrah’s love and care for others is a perfect illustration of Jesus’ commandment to love your neighbor as yourself. Lectionary Links: September 5, 2010 by Storypath is licensed under a Creative Commons Attribution-NonCommercial 4.0 International License.